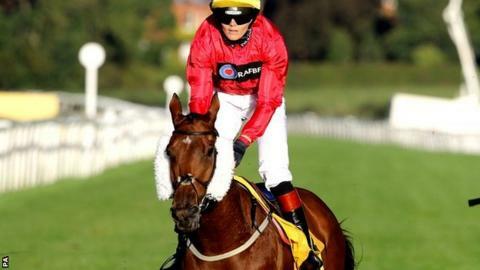 Olympic cycling champion Victoria Pendleton avoided injury after being unseated from Satanic Beat on her third competitive ride as an amateur jockey. Pendleton, who won keirin gold at London 2012, walked away after a fall in the final stages of the Rayner Bosch Car Service Handicap at Newbury. "I'm fine," the 35-year-old told the Racing Post. "I lost my balance and couldn't regain it. It's so annoying but it won't put me off." Pendleton is aiming to ride over jumps at the Cheltenham Festival in March. She retired from cycling in 2012 after adding London gold to the sprint title she won at the Beijing Games in 2008.